You crave days spent lounging in the California sunshine and nights of indulging in old Hollywood glamour. In fact, the idea of hiking in the desert past succulents and shopping at vintage boutiques has you chomping at the bit. You, dear traveler, are looking for the ideal Palm Springs vacation package, and there’s no better place to reserve your dream getaway than on Travelocity. 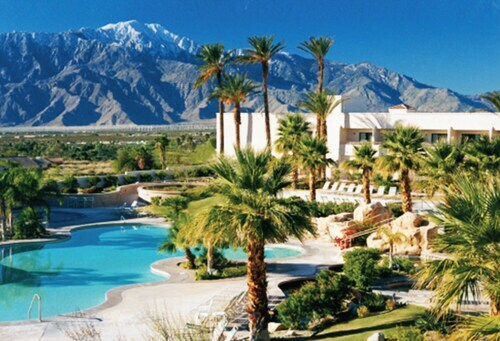 Marriott’s Shadow Ridge: This stylish Marriott property is perfect for any Palm Springs getaway. The property boasts both intimate rooms for romantic jaunts and sizable villas for the whole family. No matter what type of sojourn you’re taking, you’re bound to soak up some quality rest and relaxation on the resort’s pristine golf course. 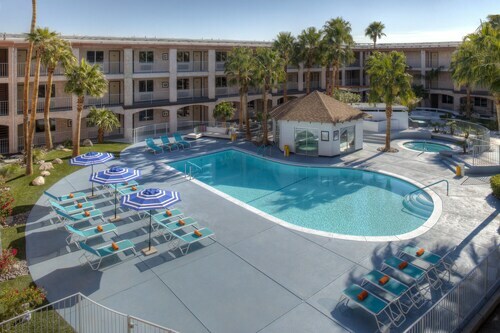 Hard Rock Hotel Palm Springs: Offering a fresh and fun restaurant, a luxurious pool, and fitness and spa amenities for all guests, you might be tempted to spend your entire vacation at your accommodation. When it’s time to depart from the Hard Rock, you’ll be conveniently located just two miles away from the Palm Springs International Airport. 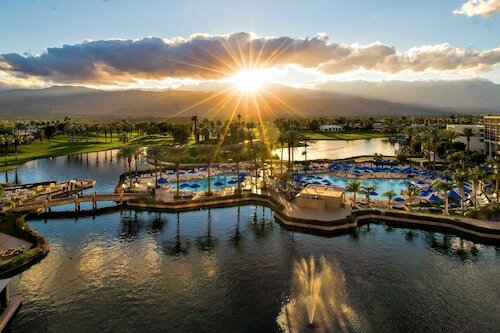 Omni Rancho Las Palmas Resort & Spa: With sweeping views of the Santa Rosa and San Jacinto Mountains, you’ll feel that you’ve been transported to rugged California backcountry. That is, until you immerse yourself in the pampering spa services offered by the resort. Let the self-love continue by transporting yourself two miles to the McCallum Theatre–because you’ll really feel the benefits of your massage sinking in as you watch a live show. 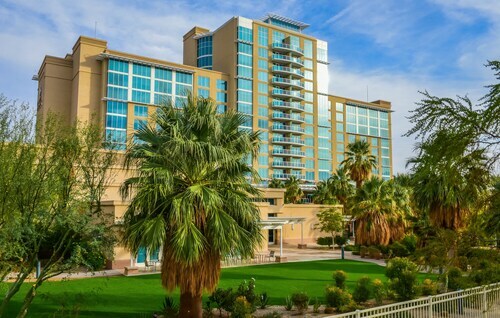 Agua Caliente Resort Spa: Spacious rooms, flat screen televisions, oversized tubs, and modern furniture are just a few things to love about the Agua Caliente. Not to mention the two pools, a Jacuzzi, and massive casino on the resort’s property. When you manage to pry yourself away from the casino buffet, steer yourself to the nearby Mission Hills Country Club for a day of swinging on the green. No vacation in Palm Springs would be complete without spending copious quality time outdoors. Pack your favorite pair of running shoes and hit the trails around the palm-tree-lined Palm Canyon. Those looking to enjoy the sunshine without working up too much of a sweat will prefer the moderate paths available at Murray Canyon, and hikers who embark on the trail at Tahquitz Canyon will be greeted by a waterfall that feels closer to a mirage than reality at the end of their workout. Romantic vacation in Palm Springs don’t have to be all sport and no speculation. 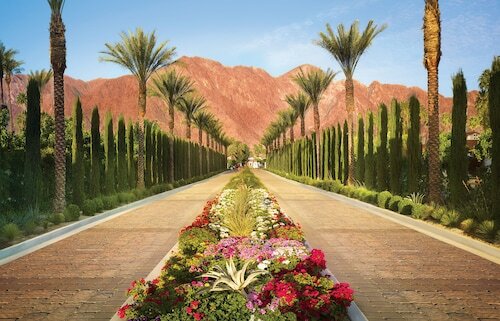 Brush the desert dirt off your pants, don your favorite pair of sunglasses, and visit Palm Canyon Drive. As Palm Springs’ main street, Palm Canyon Drive is lined with designer boutiques, trendy souvenir shops, and mouthwatering restaurants that will encourage you to toast to time well spent. Less than two miles away is the bustling Backstreet Arts District, which boasts realistic paintings, larger-than-life sculptures, and handcrafted jewelry that makes for the perfect memento to remember your time in sunny California. As you browse through an extensive list of package deals in Palm Springs, keep in mind that the city is bustling with exciting events year-round. Those keen on visiting in January shouldn’t miss out on the coveted Palm Springs Art Festival, during which time hundreds of artists display their talents for all to see. Planning on making it out to Indio in April for Coachella? Palm Springs is a 30-minute drive from where the mega music festival is held, and you’ll be able to get a solid night’s sleep by staying outside of Indio. Also in the spring is the world-renowned White Party. Every year, more than 20,000 members of the gay community and their allies venture to Palm Springs to dance, socialize, and swim at luxurious star-studded pool parties. With visions of sunshine and palm trees swirling in your head, it’s time to book your trip to Palm Springs right here on Travelocity. Sort through a variety of accommodations, flights, and car rentals, and save big when you choose to book a package. The next thing you know, you’ll be reserving a lounge chair by the pool and sipping on a margarita. Ah, this is what vacation is meant to feel like. Need insider tips on must-see attractions in Palm Springs? Check out our Palm Springs travel guide! 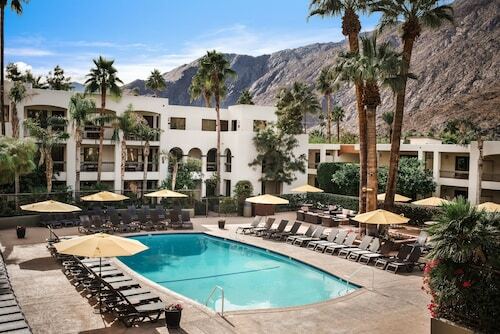 Built by Lucille Ball and Desi Arnaz as an exclusive desert getaway, this serene hotel overlooks lush fairways in the shadow of the Santa Rosa Mountains, 16 miles from downtown Palm Springs. Situated in Desert Hot Springs, this spa hotel is 0.8 mi (1.4 km) from Sand to Snow National Monument and within 3 mi (5 km) of Desert Hot Springs Town Center and Cabot's Pueblo Museum. Palm Springs Aerial Tramway and Palm Springs Convention Center are also within 12 mi (20 km). Situated in Rancho Mirage, this spa resort is 2.1 mi (3.4 km) from Children's Discovery Museum of the Desert and 2.9 mi (4.6 km) from Century Park. Cathedral City Marketplace and Big League Dreams Sports Park are also within 6 mi (10 km). A luxurious celebrity hideaway since it opened in 1926, this golf resort is set against the rugged Santa Rosa Mountains, 10 miles from Palm Desert, and 22 miles from Palm Springs. Located in the golf, residential, and resort community of Palm Desert, this 400-acre Palm Springs-area resort includes 23 acres of artificial waterways. The River at Rancho Mirage entertainment complex is 4 miles away. Boat Shuttles will be unavailable from Aug. 20 - Aug. 31, 2015 due to necessary lake repairs. Situated in Desert Hot Springs, this spa hotel is 0.2 mi (0.4 km) from Desert Hot Springs Town Center and within 3 mi (5 km) of Cabot's Pueblo Museum and Desert Dunes Golf Club. Sand to Snow National Monument is 2.6 mi (4.1 km) away. 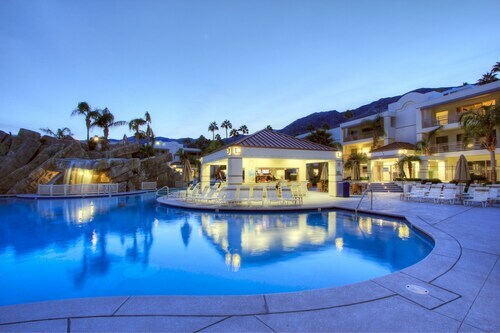 This family-friendly Palm Springs condo building is within 2 mi (3 km) of San Jacinto Mountains and Indian Canyon. Moorten Botanical Garden and Cactarium and Indian Canyons are also within 3 mi (5 km). Located in Downtown Palm Springs, this hotel is within a 10-minute walk of San Jacinto Mountains and Palm Springs Art Museum. Palm Springs Convention Center and Palm Springs Aerial Tramway are also within 3 mi (5 km).